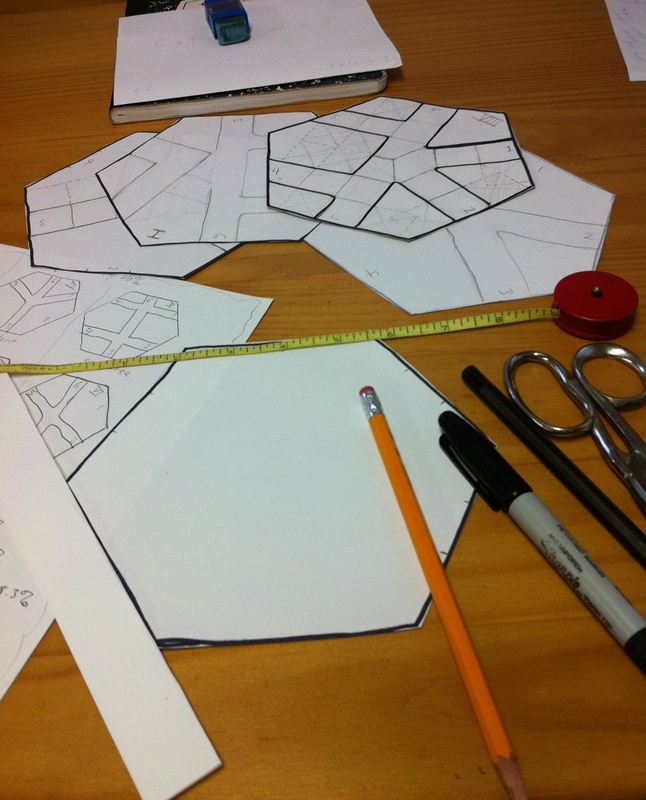 Telecanter's Receding Rules: DIY, Analog, Hexagonal Geomorphs! Making crap is fun. Have a Saturday afternoon free? International apocalypse bring down the internet? Make some geomorphs. 3) put your compass point at that spot and set it so the pencil is just at the end of the line. Scribe a circle. 4) Move your compass to the end of the line and scribe a half circle. Where this crosses the first circle is two vertices of your hexagon. 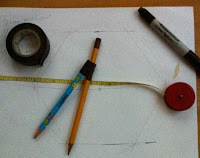 5) Put your compass on the other end of your line and scribe another half circle. This, and the ends of the line itself, will give you all 6 points of your hex. 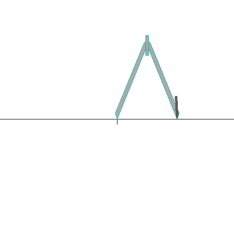 6) Use a straight edge to connect your vertices. There are a few more steps, though. 7) As you probably know, geomorphs only function if they line up correctly so we need to find the center of these faces. This step will change depending on how large of a connection you want to make between tiles. 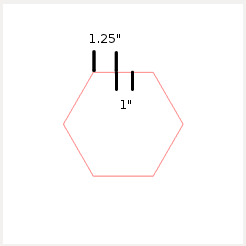 If you followed my suggestion above, your hexagon is 6" face-to-face and each face is 3.5" long. I decided on a 1" connection just for the ease of using minis, but you could be perfectly symmetrical if you want. So, for a 1" connection measure 1.25" over and mark a line on your face. Then make a mark an inch from that. 8) Repeat this for each face. 9) Now you should have a nice, regular hex of just the right size. Use this as your model. Go to a sunny window and use it as a lightbox; place your model on the window, paper over it, and trace. If you want to make tiles out of something opaque, trace the first hex onto your new material, then cut. I like the way hexes feel like you can go in almost any direction. They seem suitable for small scale paths and twisty passages because of this. But that doesn't mean you couldn't draw a normal scale dungeon with lots of rooms per tile. You might want to do this process on graph paper, though I like the idea of just giving yourself the freedom to draw without guides. I also like the idea to try to use these to make a closer scale wilderness setting, with streams and paths that connect. A nice reminder that I don't have to do everything with a computer ... well actually I could use one for this. Thanks for a fun article which brought back some fond memories of olden times and ideas for the future. I wonder what it would be like to make these out of Gaming Paper and then glue them to something like cheap black felt to hold them in place. Also, that way you could flip over to represent the dark, unexplored hexes. Very cool! You're right, hexes do have a nice tactile feel / look about them somehow, more than squares do. In brief and a frightening hand-drawn tampering with the forces of hex, I found a good aid to working is isometric paper - where you draw your hex grid to any size and still have units of measurement within the hex. @Theodric the Obscure Man, that is brilliant! if you didn't want to buy the gaming paper. Also, the weighty, non-slip factor is exactly why I'm currently trying to screen print on to heavy canvas. I was going to post with a ready-to-go hexagon template, but I got to run to the mountains again. Maybe in the next few days. I hope you do a follow-up post! Thanks Theodric, your comment kicked me out of some doldrums to get back to work. Thanks NetherWerks, I was actually pondering the idea of water and chasms aligning along the hex points, but haven't tried them out. It might be too busy.